Hurricanes, also known as tropical cyclones, are huge storms that can be highly destructive. They originate over warm ocean waters and many simply stay out over the sea, but some move inland and history is littered with examples of major hurricanes that have caused a whole lot of damage to towns and cities around the US and elsewhere in the world. The Atlantic hurricane season starts on June 1, while the Pacific season begins on May 15. Both seasons end on November 30. During this part of the year, Hurricanes can occur along any part of the Atlantic or Pacific coasts and are fully capable of heading more than 100 miles inland. The worst month for hurricanes is September, but it's important to be prepared at all times, so be sure to follow the following hurricane safety tips to keep yourself and your family as safe as possible. - Stay stocked up on emergency supplies like food, bottled water, first-aid, flashlights, gas, and more. - Learn as much as you can about your home and local area. What is the elevation level of your property? Are there any dams or levees nearby? Is flooding likely? Does the community have an established evacuation plan? - Be sure to keep trees and large shrubs trimmed down to cut the risk of them blowing into your property, and bring any large outdoor furniture indoors too. - Have a plan for your pets as well. Stock up on food for any animals in your home and speak to a vet for an advice on keeping them safe. 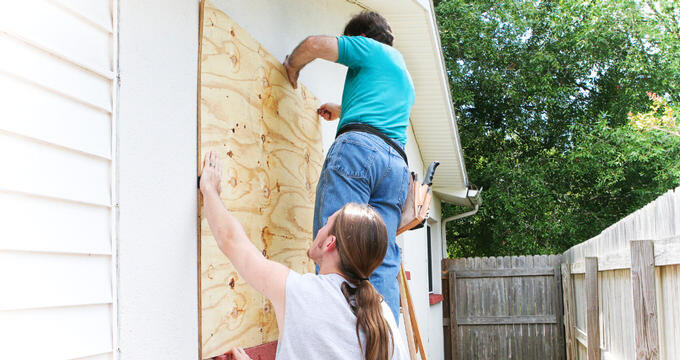 - Board up windows and reinforce garage doors. - Invest in a battery-powered radio. When disaster strikes, the power can go out, meaning that more modern technology like computers and smartphones will simply die. A radio will help you stay up to date with warnings and news. - If you have the budget, consider building a shelter or safe room. - Use radios and internet to stay up to date with warnings and alerts in the buildup to the storm’s arrival. When the hurricane arrives, it can be a very scary experience, but it can be vital to stay as calm as you can in order to keep thinking clearly and not make any dangerous decisions. Follow these hurricane safety tips during a hurricane to stay safe. - Stay indoors at all times, unless otherwise instructed by the authorities or emergency service workers. Avoid approaching any windows, and if possible, find a room or hallway in your house that doesn't have any risk of flooding. - If flooding does occur, ascend the floors of your home or the building in which you are situated, without trapping yourself in a closed space that could flood and leave you with no way out. - If you're in a low-lying, flood-prone area or a structurally weak property or building like a mobile home, try to get to a shelter as quickly and safely as possible. However, do not attempt to drive around any barriers or through any water; just a small amount of fast-moving water can be enough to send you and your vehicle off course. After the hurricane has subsided, danger still exists. With the possibility of flooding and landslides in your area, it’s vital to ensure that you and your family continue to follow all hurricane safety tips to avoid any unwanted incidents. - If you're in a safe indoor space, stay there until it's totally safe to step outside. In the meantime, try to keep up to date with alerts and announcements, or listen to authorities in your area for any instructions. - Be aware of floods. Only a small amount of water is strong enough to knock you off balance and cause injuries or worse, so avoid attempting to swim or wade in the waters. Downed power lines may also cause electrical charges in pools or standing water, so avoid these areas at all costs. - Stay away from electrical equipment in general and avoid using the phone if possible. Make use of social media and internet messaging services to contact friends and family. - Take photos of any damage to your property for insurance purposes. - Stay safe during clean-up by using protective gear.